The Sportourer X Race saddle has been made with those who want a little bit of comfort in mind. It's a budget saddle, perfect for leisure riders and commuters. The manufacturers claim that the Gel Flow system is good for longer rides and that the saddle is light, although at 370g it's not that light. It is 272mm in length and 140mm wide, meaning it's wider than most performance saddles, but this is down to the additional padding. The padding is very decent and goes from the rear of the saddle almost all the way down the nose. The rails are made of steel and are marked to make adjusting and fitting the saddle really easy. Once fitted to the bike, and it's suitable for mountain or road bikes, it does feel comfortable. I spent a good couple of hours in the saddle and it really was comfy. This would make it perfect for those who commute or ride for leisure and shorter times. I have used it a few times for shorter rides as I prefer a more performance based saddle for longer rides, but that really is personal preference. It definitely made going over bumps and kerbs much easier due to the silicone gel. But ultimately it was just too wide for me long term. 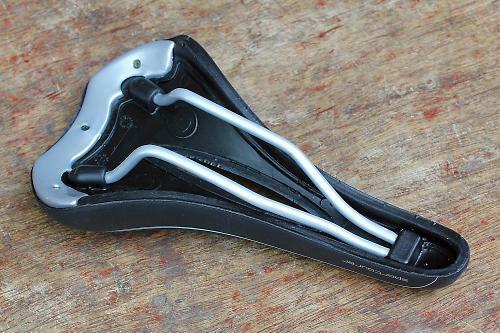 As this saddle is a little thinner in width than other gel saddles, you could easily use it on slightly longer rides without hurting your legs. I couldn't see myself using it much beyond 2-3 hour rides though because I feel I would begin to hurt in my riding position. The width is personal preference and may not be an issue for some people. If you are looking for comfort in a saddle that can do a bit of distance, then this may be for you. The saddle is aimed at road and mountain bike users. Sportourer say "The lightness of the smooth asphalt, the urge for adventure that takes you on the rough road, a steep downhill descent, the unexpected scenario ready to surprise you after every bend. Sportourer is everything you see and that excites you while riding. The pleasure of not having any particular place to go, apart from the constantly changing horizon.". The saddle was certainly comfortable and made for a decent ride, even over the rough bits. A well put together saddle that has no flaws; it's strong and will really last. In terms of comfort, this is a decent saddle. It is on the heavy side for a saddle. But makes up for this in comfort. It's designed for comfort and it delivers. A real budget saddle that delivers. You can also get it cheaper if you shop around. It was comfortable, easy to fit and a pleasure to use. I liked the comfort of the saddle for shorter rides.